Today: MZ Wallace co-founder and mother of three Monica Zwirner welcomed us into her East Village home in celebration of their new Metro Tote, made exclusively for Food52. Jackson, the Zwirner's family pup, looks into the backyard from the kitchen. "I love to cook but I don't want to be separated from the family when I do," Monica Zwirner says in reference to the long counter that runs the length of her kitchen. 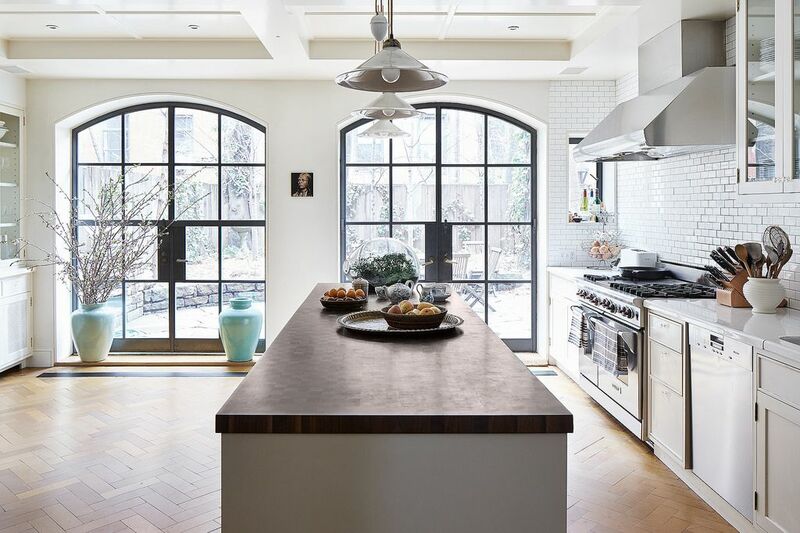 Even at the back of her lower Manhattan brownstone, this oversized island is the home's focal point from the moment I step inside the front entryway, illuminated by the light from a pair of arched french doors that flank the room at the rear of the house. It's a room you can't help but be drawn to, where Monica's family gathers to cook and eat, and where she retreats to workshop new designs for MZ Wallace, the handbag brand she runs with Lucy Wallace Eustice. From colorful accents like bowls of fruit, mugs of inky hyacinths, turquoise planters, and a massive teardrop-shaped terrarium, to the tall doors and warm tiled floor, entering the room is like walking into a Venetian palazzo, which Monica says was her inspiration. 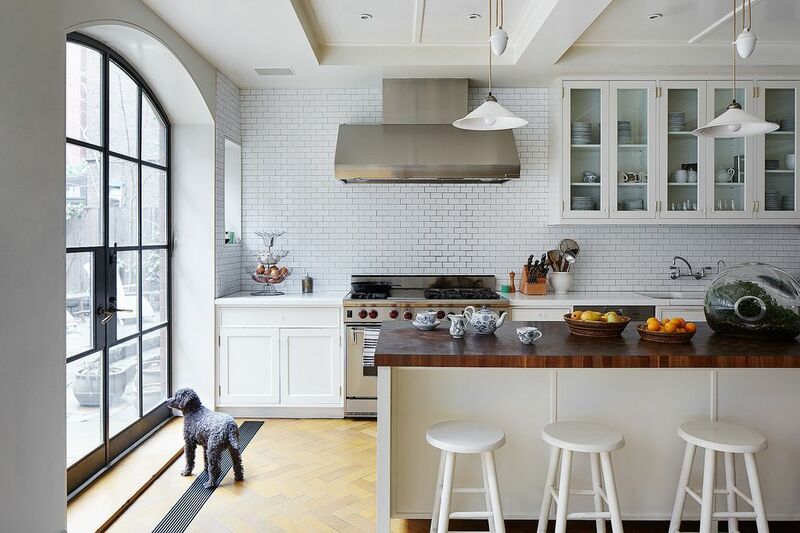 "I wanted the floor in the kitchen to be really resilient, as we do spend so much time there," she explains. "I saw a picture of an Italian kitchen—they had used stone, but layered it as if it were wood; I thought it was a great idea. Our stone is actually from India, but blends quite well with the light wooden floors that are throughout the house." Even on a gloomy day of April showers, the floors seemed to glow. The kitchen, facing towards the rear of the house as you enter it. 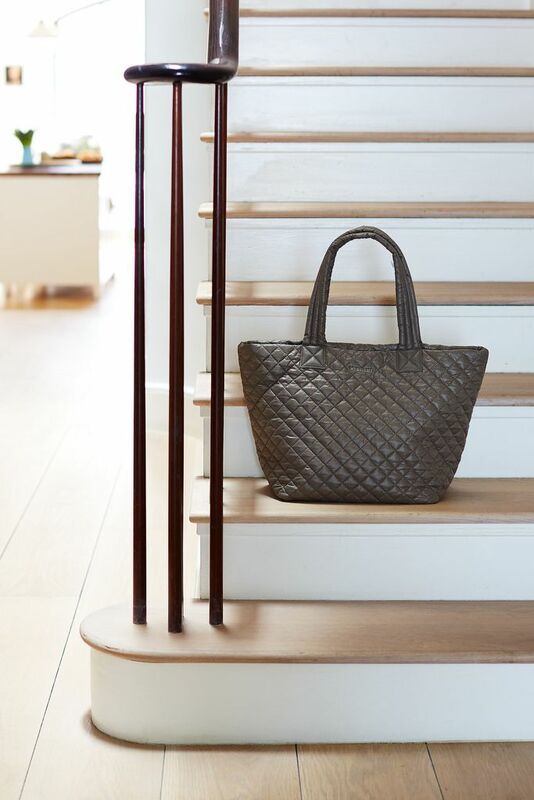 Left: the grey MZ Wallace x Food52 Metro Tote, available exclusively in our Shop; Right: the light-filled staircase in Monica's home, as viewed from the front entrance and looking towards the kitchen. I should mention that in Manhattan, where townhouses and apartments rub shoulders with nary an alleyway between them, getting good light is no small feat. In Monica's home, it's the ingenious design of the central staircase, which spills down through the heart of the building in a soft white sunbeam, that draws you inside and right towards the kitchen. 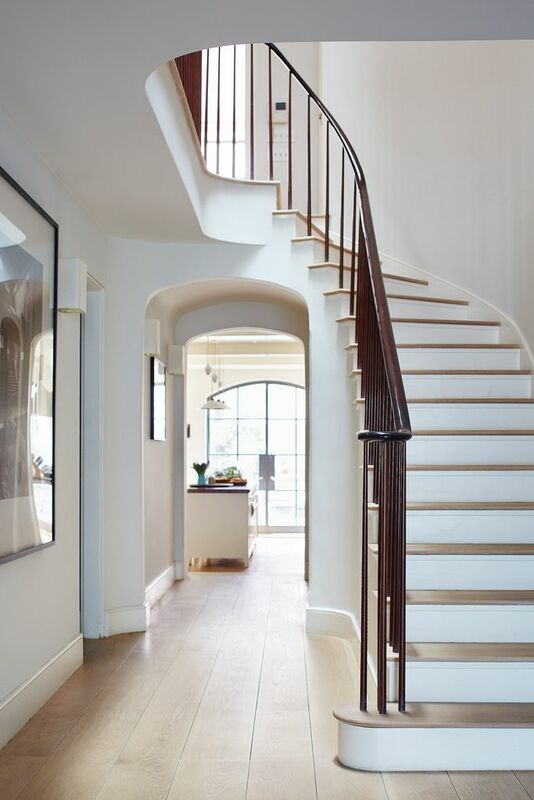 Designed by Annabelle Seldorf, the architect of the whole residence and MZ Wallace's NYC and Tokyo stores, the spiral staircase is capped four flights up with an oval skylight—the kind of feature you'd expect in a Parisian apartment building. Monica and her husband David Zwirner (of the eponymous Chelsea gallery) have three kids: Lucas, 24, Marlene, 22, and Johanna, 17. What makes them come running for dinner? "If I'm honest, it's probably a homemade pot of Bolognese sauce with pasta. It cooks for hours and the entire house smells of onion wine and olive oil...," she trails off. It's the kind of meal I imagine they'll settle down to on a grey evening like the one when I visited, though whenever they can ("spring, summer, and fall," she says) the family flings open the back doors and eats out back. Lucy (left) and Monica (right) share tea at the kitchen island by the family's Paula Hayes terrarium, which is strewn with ivy and actually misty inside there's such a clear microclimate. "Paula started the terrarium movement," Monica tells me, "which you now see everywhere." When Monica's not at home with her family, she's at MZ Wallace's Soho offices or jetting around the city for inspiration. Both women are NYC natives who met early in their careers, when Monica was a stylist and Lucy worked at Manolo Blahnik. They reconnected in 1999 after bumping into one another at the Union Square Farmers Market—a bustling marketplace that's a (surprisingly) short stone's throw from Monica's quiet East Village block—and later that year, MZ Wallace was born. Their designs are timeless, with a note of luxury from thoughtful details like subtle sheens and Italian leather zipper pulls, and also durable—the kind of bags you can actually take anywhere. Handbags touted this way are so often the first to rip at the seam of your favorite pocket, but Monica and Lucy, who love the bustling, energetic city life, take functionality seriously: "Our goal is always to design bags that have a balance of style and function, so we listen to feedback from women who wear them," Monica shares. "We really talk about what we are inspired by, what is missing from our collection, and what we want to say with a new collection." Monica says that she and Lucy "bring to MZ Wallace all the elements of our lives: our curiosity, what inspires us, and what we each hope to wear ourselves that suits the busy lives we lead." The Zwirners' breakfast corner, a clean, cozy affair with bracketed wall benches and suede cushioning. Most recently, Monica and Lucy got together with our own founders, Amanda and Merrill, to come up with a version of their classic Metro Tote just for Food52. The result is a sophisticated grey nylon bag with an ocean-inspired wave print on the interior (shop for it here!). It's amazingly lightweight (crafted in their quilted Oxford Nylon) and will hold its shape forever so you can crush, roll, and pack it up for extra toting on the go. In celebration of the Earth Day launch, 15% of the proceeds from each MZ Wallace x Food52 Metro Tote purchase will go to charity: water, a non-profit organization whose mission is to bring clean drinking water to people in developing countries. A few prototype bag designs are hanging casually on a chair at Monica's breakfast table when we arrive, along with swatches of fabrics, zipper pulls, and color palettes lined up for consideration. It's clear that this home is as much a place of inspiration as it is a family haven. The table's toasty brown suede cushions bear the imprint of many weekend meals, when Monica says the family eats and lingers "where it's a bit more comfortable to lounge!" Left: the Zwirners' open shelving in their pantry; Right: the kitchen fireplace, decorated with artwork from friends and their own kids. 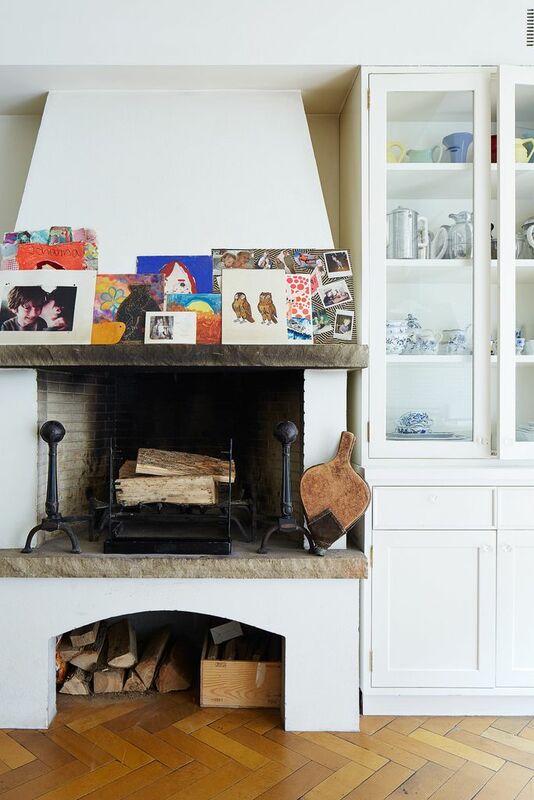 Just to the side of the breakfast corner is a fireplace with a grill for cooking and colorful drawings clustered on the mantle. "We keep adding pictures that appear from the kids or from friends," says Monica. 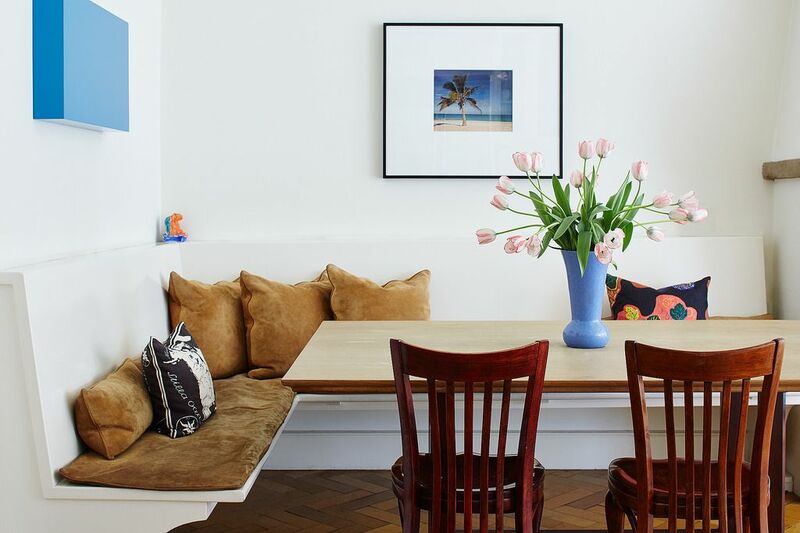 In the home of a handbag designer and famed international art dealer, it's comforting to see this moment of hominess. The space is so clearly one that's lived in and not the least bit austere or gallery-like. Around the corner, their walk-in pantry is stocked with delicacies like homemade preserves and a gallon-jar of fresh granola, but it's still somehow relatable. 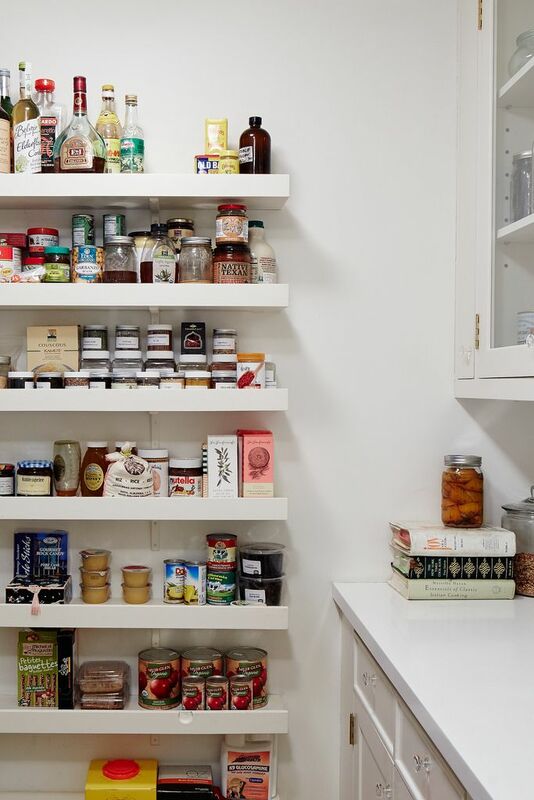 The smart shallow shelves are stacked with everyday condiments, canned pineapple, and jars of honey, and tattered, dog-eared cookbooks line the walls. Shop the exclusive MZ Wallace x Food52 Metro Tote in our Shop! building a new kitchen, liked your fixtures, where can i find them? Oh that kitchen, with a fireplace! !